It all began during Christmas break in 2006 when I travelled to India on a family vacation. During this trip, I first visited the Abhilasha School located in Rajnandgaon, a small rural town in central India. The school was founded in 1995 by my uncle, Abdulla Yusuf, and provides free education, housing and medical care to over 140 students with various disabilities (primarily blind and physically disabled children). Growing up in Canada, I had never thought about the difficulties and wide-spread discrimination these children have to face on a daily basis. People seem to see their disability first. Upon returning to Canada, inspired and invigorated, my sisters and I co-founded The Abhilasha Project (TAP), an organization with the mission of providing quality education to underprivileged children, with a special focus on girls and children with disabilities. According to UNESCO, 90% of children with disabilities in developing countries don’t attend school. Moreover, disabled girls are doubly disadvantaged because of their gender in addition to their disability. 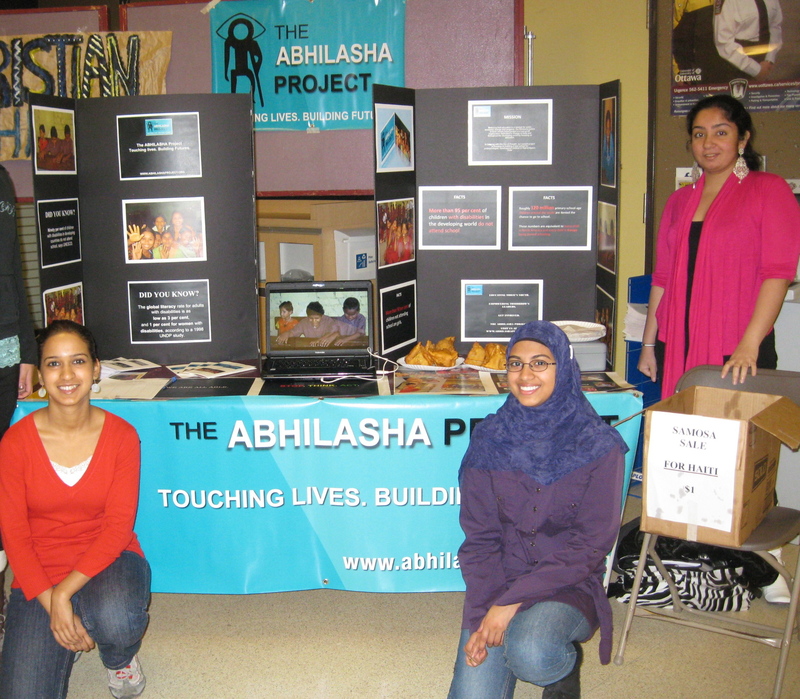 Over the years, The Abhilasha Project has grown to include three student-run chapters across Canada—including one at the University of Ottawa, started in 2007. In January 2013, a group of TAP volunteers camped out for a week in the Morisset Library as part of the yearly Live-in For Literacy event. The group of energetic TAP members finished the year in action at Montpetit Gym in round two of the Dodge for Humanity charity dodgeball tournament, an event run in partnership with the Humanity First uOttawa. In October 2011, The Abhilasha Project was recognized by Forces AVENIR for its commitment to social justice and student engagement and was selected as recipient of a Forces Avenir award in the Mutual Aid, Peace and Justice category. TAP also received a $4,000 bursary with the award. The award gala provided an extraordinary platform to highlight all the volunteers and projects during the evening. In August 2011, my sister and I—along with a group of 10 university students embarked on an unforgettable journey across the Himalayas to raise funds for the project and spend time with the children at the Abhilasha school. During my most recent visit to Rajnandgaon in February 2013, I spent a week at the school talking to students and teachers about their hopes and dreams for the future. In the coming year, we’ll be implementing two pilot projects, including an English blended-learning program that will combine computer-based language learning and virtual tutoring sessions with volunteers in Canada and the U.S. We believe that learning should be a dynamic and engaging process. The current school is in a terrible state. Space is scarce and the facilities, in a rented government stadium, aren’t accessible for people with disabilities. Our hope is to build a new fully sustainable and accessible building that will accommodate more than 350 students from across India and provide an inclusive approach to education. However, we have many obstacles to overcome in order to reach our goal. Land prices have gone up exponentially, bureaucratic red tape never ceases to surprise and construction hurdles too numerous to keep track of in India make this no small feat. And of course, we require the funds to meet our estimated budget of around C$2.5 million. Yes…We have big dreams and even bigger plans! We have a long road ahead, but we’re determined. These children deserve an equal opportunity to succeed in society and show the world they’re able to reach their full potential. If you’re interested in joining TAP or would like more information, please feel free to email me at abhilasha.project@yahoo.com or visit www.abhilashaproject.org. Le Bénévole est le bulletin d’information produit par le Centre d'engagement mondial et communautaire de l'Université d'Ottawa. Le Bulletin est publié cinq fois par année et comprend des articles, des histoires de réussites, des rapports statistiques, des rappels, des biographies sur les lauréats et plus encore! The Volunteer is the Newsletter produced by the Centre of Global and Community engagement of the University of Ottawa. The Newsletter is published fives times a year and includes articles, success stories, statistics reports, reminders, award recipients biographies and more! Gallery | This entry was posted in Uncategorized and tagged Août 2013, August 2013. Bookmark the permalink.